1 of 4 In a medium bowl, whisk flour, baking soda, ginger, cinnamon, cloves and salt. 2 of 4 In a large bowl, beat butter and sugar until smooth. Beat in egg, then molasses. Stir flour mixture into butter mixture. Divide dough in half, wrap and chill for 2 hours. 3 of 4 Heat oven to 350 degrees . On a well-floured surface, roll half of dough to 1/8-inch thickness. 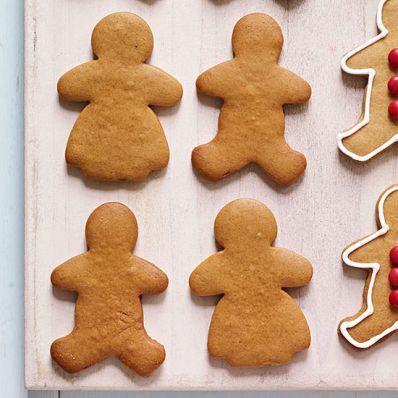 Cut into shapes with assortedsize gingerbread cookie cutters; transfer to ungreased baking sheets. Re-roll scraps and cut. Repeat with rest of dough. 4 of 4 Bake at 350 degrees for 13 minutes. Transfer cookies to racks to cool. Decorate with Royal Icing, if using. 1 of 1 In a bowl, beat confectioners' sugar, powdered egg whites and 3 tbsp water until thick and shiny, about 5 minutes. Transfer to a pastry bag with a writing tip. Outline cookies and pipe on dots of frosting; add M&M's minis as buttons. Let dry. Per Serving: 62 mg sodium, 2 g pro., 3 g Fat, total, 134 kcal cal., 0 g fiber, 25 g carb., 2 g sat. fat, 15 mg chol.